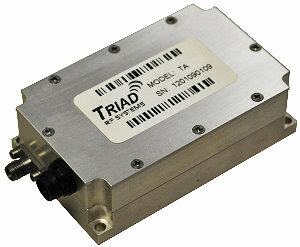 June 9, 2017 - The TTRM1010 is a Bi-Directional SSPA for small to medium size UAS applications. In addition to its broad frequency range it also contains internal DC conversion circuitry that allows it to be powered by an input voltage range of 9-36 VDC. Features: Manual or Automatic Tx/Rx Switching Available, Optional Heatsink, Over / Under / Reverse Voltage Protection, Thermal Shutdown, VDS Versatile DC Supply +9 to +36 V.